Gokcen B, Ozyurek S, Atik A, Sivrioglu AK, Kaya E, Keklikci K. Successful Closed Manipulation of Simple Lateral Dislocation of the Elbow Joint: A Case Report. Oman Med J 2013 Nov; 28(6). Elbow dislocations are generally classified as simple or complex and according to the position of the radius and ulna in relation to the humerus after injury. When an associated fracture exists, the dislocation is called complex; without a fracture, the dislocation is simple.1,2 Based on the position of the radius and ulna, elbow dislocations are classified into posterior, anterior, medial, lateral, and divergent types. The most frequent dislocations of the elbow joint are posterior or posterolateral dislocations.3 The treatment principles of simple dislocations include reduction of the joint and early motion,1 and the dislocated joint can be reduced using closed or open techniques. At closed reduction, the reduction can be hindered by swelling and soft tissue interposition.4,5 This case report presents a rare lateral traumatic elbow dislocation and its treatment with closed reduction. A written informed consent was obtained from the patient for publication of this case report and images. A 40-year-old woman fell on her left arm with her left hand outstretched while running. Her elbow joint was in an extended position when she fell. She felt sudden severe pain on her elbow joint. Two hours after the trauma, she was admitted to Aksaz Militaary Hospital orthopedics and traumatology emergency department because of the left elbow pain and deformity. With her other hand, she was holding her elbow in a semi-flexed, pronated position. Clinically, her elbow was deformed. After the trauma, she had immediately applied ice on her elbow because her elbow was not excessively swollen. We could not palpate the olecranon in its anatomic location. The olecranon fossa was palpable and it was empty. The neurologic examination was intact. The radial pulse was palpable. Anteroposterior and lateral radiographs of the elbow showed lateral convergent displacement of the radius and ulna relative to the humerus, i.e., lateral elbow dislocation (Figs. 1a, b). Under sedation with 10 mg diazepam and 5 mg midazolam, closed reduction was attempted. 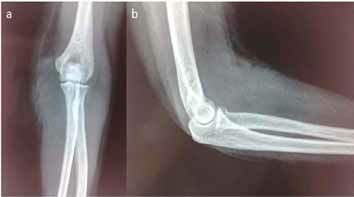 Figure 1: (a) Anteroposterior radiograph of the dislocated elbow; (b) Lateral radiograph of the dislocated elbow. During the reduction maneuver, we first applied gentle longitudinal traction in the axis in the semi-flexed position without forcing the elbow in extension. While applying the longitudinal traction, an assistant held the distal humerus near the elbow joint. When we scrolled the forearm medially, the assistant pushed the humerus laterally. During this maneuver, we heard a click and the patient relaxed suddenly. Post-reduction radiographs were obtained (Figs. 2a, b). No varus or valgus instability of the joint was observed. 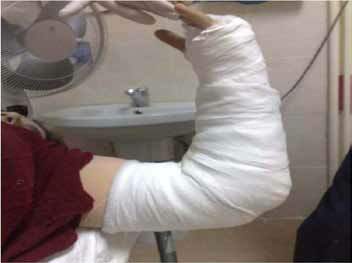 The elbow joint was immobilized in 90 degrees of flexion with the forearm in supination in a posterior plaster cast for 2 weeks (Fig. 3). After 2 weeks, the plaster was removed. For an additional 2 weeks, she wore a splint at night for comfort. An intensive physiotherapy regime was started 3 weeks after the trauma and her elbow was examined weekly. After 8 weeks, the elbow range of motion was from 10 degrees to 130 degrees. Figure 2: (a) Anteroposterior radiograph of the dislocated elbow after reduction; (b) Lateral radiograph of the dislocated elbow after reduction. Figure 3: Immobilization of the elbow joint after reduction. In a systematic review of the literature, de Haan et al.7 reported three cases of lateral dislocation in 342 patients with dislocated elbows and one case of anterolateral dislocation. Schippinger et al. found only one case of simple anterolateral dislocation in a series of 45 patients.8 In elbow dislocations, a complete neurological examination is mandatory. Although ulnar and median nerve involvement is frequent after simple dislocations,4,9,10 no neurological deficit was observed in our case. X-Rays are essential for determining the direction of the dislocation and the presence of associated fractures.11 In dislocations accompanying a fracture, computed tomography (CT), including three-dimensional (3D) reconstructions, is invaluable for assessing the injury and planning surgical treatment.10 Our case was a simple lateral dislocation with no associated fracture, Thus CT or 3D reconstructions were not deemed necessary. The treatment for simple dislocation of the elbow is closed reduction and initial immobilization, followed by mobilization.1,10,12,13 Closed reduction can be performed under general anesthesia or sedation. Numerous reduction techniques have been advocated for elbow dislocations.14-17 They all have the common goal of applying the two major traction forces along the axes of the humerus and forearm. In 1953, Lavine described a simple technique of reducing posterior dislocations of the elbow joint by seating the patient in a chair and resting the arm over the back of the chair for 5 or 10 minutes.14 This reduction type needs relaxation and cooperation from the patient. In 1957, Parwin encountered 20 posterior elbow dislocations.15 He used a technique consisting of placing the patient on a high table in a prone position, gentle downward traction at the wrist for a few minutes and lifting the humerus laterally to complete reduction. In 1974, Meyn and Quigley described reduction of posterior dislocation of the elbow by traction on the dangling arm and grasping the olecranon with the operator’s other hand.16 In 1993, Minform and Beattie described two patients with posterior dislocation of the elbow in whom the dislocation was reduced atraumatically by modified hanging arm method in prone position.17 The same principle also theoretically can be applied to simple lateral dislocations of the elbow.4,5,9,18 Khan et al.4 reported modification of the gravity-aided ‘hanging arm’ technique originally described for shoulder dislocations by Stimson (modified Stimson’s technique) for pure lateral traumatic dislocation of the elbow. Their technique differed in such a way that it required two persons to manipulate; as the main operator guides the olecranon in a purely medial direction with both hands, the assistant constantly applies counterforce. After reduction, the stability of the elbow joint must be assessed. A congruous, concentric reduction is critical for the stability of the elbow.10 Gently varus and valgus stress testing after reducing a dislocated elbow joint is important to rule out instability and ligamentous injury.12 To rule out instability, we performed varus and valgus stress tests. Both of these tests were normal. We also tested the stability by extending and flexing the elbow. Redislocation or subluxation did not occur. If the elbow subluxes or dislocates in extension, and the stability is reassessed with the forearm in pronation, a hinged brace should be considered.10 If the elbow joint is stable after reduction, plaster immobilization is the preferred treatment.8 In our case, due to the stability of the elbow joint, we opted for plaster immobilization. Treating the patient without a splint after an elbow dislocation is not recommended.8 In our patient, we applied a posterior plaster cast at 90 degree of elbow flexion, with the forearm in supination. Prolonged immobilization of the elbow joint after elbow dislocation is not recommended,7,10,12,13 as immobilization for more than 14 days may be associated with stiffness.7 In this report, the elbow was immobilized for 2 weeks. After 8 weeks, the patient had a range of motion from 10 degrees to 130 degrees. In this report, we presented a rare traumatic simple lateral dislocation of the elbow joint and its successful closed reduction, which is even rarer. Although reduction of the elbow joint is important, testing the stability is as important as reduction to restore joint congruence. If the joint is stable, early motion is important in order to avoid joint stiffness. This case report highlights the importance of the use of this simple closed reduction technique initially in order to avoid possible complications with general anesthesia and surgery and illustrates how excellent functional outcome can be achieved with early motion. 2. Anvar R, Tuson K, Khan SA. Dislocations of the elbow. In: Classification and diagnosis in orthopaedic trauma. Cambridge: Cambridge University Press; 2008. Chapter 2.2G, pp 76–79. 3. Miller MD. (2004) Upper and lower extremity injuries and pelvic injuries. Elbow. In: Review of orthopaedics, 4th edition. Philadelphia: Saunders; 2004. Chapter 10, p 537. 4. Khan SK, Chopra R, Chakravarty D. Successful closed manipulation of a pure lateral traumatic dislocation of the elbow joint using a modified Stimson’s technique: a case report. J Med Case Rep 2008;2(2):170. 5. Bhosale ND, Raut PP, Shankar A. 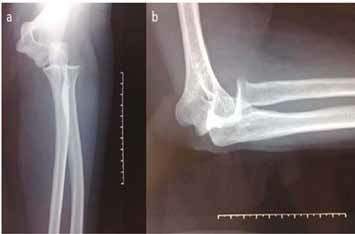 Pure lateral traumatic dislocation of elbow joint: a case report. The Journal of Moharashtra Orthopaedic Association 2012;7(3):12-13. 6. Al-Balushi H, Al-Kalbani A, Al-Khwaldi T, Al-Suqri S, Al-Maniri A, Alazri M, et al. Injuries presented at a primary care setting in oman. Oman Med J 2012 Nov;27(6):486-490. 7. de Haan J, Schep NW, Tuinebreijer WE, Patka P, den Hartog D. Simple elbow dislocations: a systematic review of the literature. Arch Orthop Trauma Surg 2010 Feb;130(2):241-249. 8. Schippinger G, Seibert F-J, Steinböck J, Kucharczyk M. Management of simple elbow dislocations. Does the period of immobilization affect the eventual results? Langenbecks Arch Surg 1999 Jun;384(3):294-297. 9. Chhaparwal M, Aroojis A, Divekar M, Kulkarni S, Vaidya SV. Irreducible lateral dislocation of the elbow. J Postgrad Med 1997 Jan-Mar;43(1):19-20. 10. Mudgal CS, Jupiter JB. New concepts in dislocations of the elbow. Tech Orthop 2006;21(4):347-362 . 11. Royle SG. Posterior dislocation of the elbow. Clin Orthop Relat Res 1991 Aug;269(269):201-204. 12. Symeonides PP, Grigoriadis NC, Hatzokos IG. Anterior dislocation of the elbow. J Shoulder Elbow Surg 2006 Mar-Apr;15(2):249-251. 13. Van Riet RP. Elbow dislocations. Curr Orthop Pract 2008;19(6):616-620. 14. Lavine LS. A simple method of reducing dislocations of the elbow joint. J Bone Joint Surg Am 1953 Jul;35-A(3):785-786. 15. Parvin RW. Closed reduction of common shoulder and elbow dislocations without anesthesia. AMA Arch Surg 1957 Dec;75(6):972-975. 16. Meyn MA, Quigley TB. Reduction of posterior dislocation of the elbow by traction on the dangling arm. Clin Orthop Rel Res 1974;106-108. 17. Minford EJ, Beattie TF. Hanging arm method for reduction of dislocated elbow. J Emerg Med 1993 Mar-Apr;11(2):161-162. 18. Vijaya S. Lateral dislocation of the elbow joint. Singapore Med J 1966 Sep;7(3):139-141. 19. Exarchou EJ. Lateral dislocation of the elbow. Acta Orthop Scand 1977;48(2):161-163.